It’s almost Easter, and spring is on its way! While many of us welcome the longer, warmer days, there are some for whom spring and early summer just bring a new set of health problems. For those who suffer from hay fever, symptoms may start as early as February/March (tree pollen). The grass pollen season is at its height between May and July. 10-30% of adults suffer from hay fever, and as many as 40% of all children. Hay fever is also known as allergic rhinitis. In hay fever sufferers, an inappropriate immune response occurs when pollen is inhaled. The immune system releases a substance called histamine in response to the allergen. It is histamine that causes the symptoms. These get worse when pollen is high and include itchy eyes and throat, a runny nose, headaches and blocked sinuses and a shortness of breath. Hay fever is known as an “atopic” condition and is often occurs in individuals prone to other atopic conditions such as eczema, asthma and allergies. What underlying factors contribute to hay fever? As hay fever is an inappropriate immune system response, we need to look at the health of the immune system. Our immune system develops in childhood as we come into contact with a range of micro-organisms in the environment – in mud as we play outdoors, from pets, from crawling around on floors that are not spotlessly clean. These contribute to the development of a healthy gut microbiome and also provide training for the immune system, teaching it how to cope appropriately with micro-organisms. One theory around the development of hay fever is called the “hygiene hypothesis”. Our modern environment is much more sterile than it was even a generation ago, and many children grow up spending much less time outdoors than their parents did. This may result in an unbalanced immune system which is more likely to result in allergic responses. Factors which have been associated with a lower risk of developing hay fever include not having antibiotics in early life, being breastfed, being born by normal vaginal delivery and being brought up on a farm (1). These all contribute to the colonisation of the gut microbiome and therefore to the normal development of the immune system. If you’re interested in a bit of scientific detail, the immune system has 2 branches: Th1 and Th2. Th1 relates to cellular immunity – this is the body’s defence against pathogens in our cells (such as viruses) and defective cells (such as cancer). Th2 relates to humoral immunity – the body’s defence against pathogens outside our cells (such as parasites), by producing antibodies to those pathogens. Ideally, these two arms of the immune system are balanced, like a seesaw. One hypothesis is that disease can result if one branch dominates over the other (2). Allergies, asthma, eczema and hay fever are thought to occur as a result of overactive Th2 immunity. This is a great oversimplification, but it may nevertheless direct support for the immune system in hay fever sufferers, as discussed later. 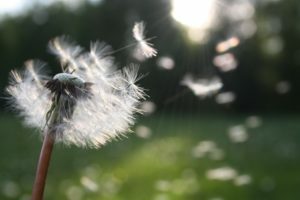 Another factor in the development of hay fever, common to other allergies, is the presence of increased intestinal permeability, or “leaky gut”. (For an explanation of leaky gut read this article.) The presence of intestinal permeability results in an increase in the number of foreign particles which the immune system has to deal with. This is thought to result in allergies. As hay fever is an inflammatory condition, following an anti-inflammatory diet can be helpful. This means eating plenty of vegetables, some fruit, oily fish (such as salmon, mackerel or sardines), walnuts, flaxseeds and chia seeds, plus anti-inflammatory spices such as turmeric and ginger. The other side of this is to reduce pro-inflammatory foods; these include sugar, refined carbohydrates, vegetable oils and processed foods. Some people may also benefit from reducing meat, as it includes the pro-inflammatory fat arachidonic acid. Remember that the immune system identifies pollen as an allergen and releases histamine which is responsible for hay fever symptoms? Well, there are certain foods which are high in histamine. Under normal circumstances, when histamine levels in the body are low, histamine in food can be processed and broken down without causing any problems. But when histamine levels are already high, such as in hay fever sufferers, removing histamine-rich foods from the diet can reduce the overall load. Foods high in histamine include pickles, fermented foods such as sauerkraut, aged cheeses, canned goods, vinegar, salty snacks, alcohol and smoked meats. Removing these from the diet at least during the months when hay fever is a problem can help reduce symptoms. The compound quercetin may improve Th1/Th2 balance (3) and so have anti-allergic effects. It is found in red onions, apples, some berries, green tea and cruciferous vegetables. It also helps stabilise mast cells in the body, preventing the release of histamine which causes hay fever symptoms. And finally, quercetin can help reduce intestinal permeability by helping form tight junctions between cells lining the gut (4). So three good reasons to try increasing your intake of quercetin if you suffer from hay fever! Quercetin is also available in supplement form, often combined with vitamin C (which also stabilises mast cells to reduce histamine release) and bromelain, which animal studies indicate may reduce allergic sensitisation (5). The balance between the 2 arms of the immune system is governed by cells called regulatory T cells. These can calm the kind of hyper-reactivity which can result in hay fever and allergies. Regulatory T cells are mainly located in immune tissue in the gut, and the gut bacteria interact with them. We can influence this interaction with probiotics. In particular, the strains Lactobacillus acidophilus NCFM and Bifidobacterium lactis can reduce hay fever symptoms when taken for 4 months, starting before the onset of the high pollen season (6). A substance called beta-glucans, found in mushrooms, can also help balance the immune system and reduce the allergic response to pollen (7). Other foods such as stinging nettles have a traditional use for hay fever support (8). If you are prone to hay fever, it’s best to get prepared before the season begins. You could start taking a high potency probiotic with strains proven to reduce hay fever symptoms a month or so before your symptoms usually begin. 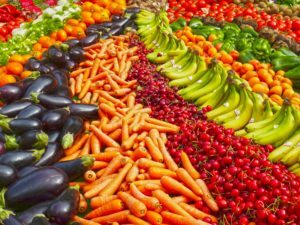 Then a good first step would be to adopt an anti-inflammatory diet, with plenty of vegetables, fruit and oily fish, no processed foods, sugar or excessive meat. You may find you need to reduce the high histamine foods listed above to decrease your symptoms. And then there are specific foods and supplements which you can add to your diet to give yourself extra support. Lynch, S.V. (2016). ‘Gut Microbiota and Allergic Disease. New Insights’, Annals of the American Thoracic Society, 13(Suppl 1), ppS51-S54. [Online]. Available at https://www.ncbi.nlm.nih.gov/pmc/articles/PMC5015732/ (Accessed 28 March 2018). Kidd, P. (2003). ‘Th1:Th2 Balance: The Hypothesis, its Limitations, and Implications for Health and Disease’, Alternative Medicine Review, 8(3), pp223-246. [Online]. Available at http://citeseerx.ist.psu.edu/viewdoc/download?doi=10.1.1.333.4347&rep=rep1&type=pdf (Accessed 20 March 2018). Mlcek, J., Jurikova, T., Skrovankova, S. et al. (2016). ‘Quercetin and Its Anti-Allergic Immune Response’, Molecules, 21(5), 623. [Online]. Available at http://www.mdpi.com/1420-3049/21/5/623/htm (Accessed 28 March 2018). Secor Jr., E.R., Szczepanek, S.M., Castater, C.A. et al (2013). ‘Bromelain Inhibits Allergic Sensitization and Murine Asthma via Modulation of Dendritic Cells’, Evidence-Based Complementary and Alternative Medicine, 2013, 702196. [Online]. Available at https://www.ncbi.nlm.nih.gov/pmc/articles/PMC3870104/ (Accessed 28 March 2018). Suzuki, T. and Hara, H. (2011). ‘Role of flavonoids in intestinal tight junction regulation’, The Journal of Nutritional Biochemistry, 22(5), pp401-408. [Online]. Available at https://www.sciencedirect.com/science/article/pii/S0955286310001877 (Accessed 21 March 2018). Ouwehand, A.C., Nermes, M., Collado, M.C. et al. (2009). ‘Specific probiotics alleviate allergic rhinitis during the birch pollen season’, World Journal of Gastroenterology, 15(26), pp3261-6238. [Online]. Available at https://www.ncbi.nlm.nih.gov/pmc/articles/PMC2710782/ (Accessed 28 March 2018). Kirmaz, C., Bayrak, P., Yilmaz, O. et al. (2005). ‘Effects of glucan treatment on the Th1/Th2 balance in patients with allergic rhinitis: a double-blind placebo-controlled study’, European Cytokine Network, 16(2), pp128-134. [Online]. Available at http://www.jle.com/download/ecn-265827-effects_of_glucan_treatment_on_the_th1_th2_balance_in_patients_with_allergic_rhinitis_a_double_blind_placebo_controlled_study–WrucxH8AAQEAABzVLzYAAAAE-a.pdf (Accessed 28 March 2018). Roschek Jr., B., Fink, R.C., MsMichael, M. et al. (2009). ‘Nettle extract (Urtica dioica) affects key receptors and enzymes associated with allergic rhinitis’, Phytotherapy Research, 23(7), pp920-926. [Online]. Available at https://www.ncbi.nlm.nih.gov/pubmed/19140159 (abstract only). Accessed 29 March 2018).